Osteogenesis imperfecta (OI) is the most common inherited disorder of bone fragility in children, increasing fracture risk 100-fold and can feature dental and facial bone involvement causing additional morbidities. To assess the utilisation of tertiary dental services by children and young people with OI attending a supra-regional multi-disciplinary OI service and review of the pathology identified and interventions undertaken. Case notes review of the current caseload of children and young people (0–18 years) with OI at a large regional OI specialist centre (n = 92). Primary outcome was whether an initial dental assessment was arranged in a tertiary dental centre and the corresponding attendance. 49% had a tertiary dental assessment arranged, of whom 82% attended (one quarter requiring several appointments) and 18% did not attend (DNA).Those travelling > 100 miles had a DNA rate of 47%. Assessed children had dentinogenesis imperfecta (24%, 50% in Type III OI), radiographs (95%), caries (41%), required extraction under general anaesthesia (38%) and malocclusion (30%). 48% of the total cohort received bisphosphonates. Tertiary dental assessment encountered barriers to uptake of recommended referral in all patients, often due to geographic factors of travel distance, yet when implemented did identify pathology in a large proportion and many resulted in dental intervention. These emphasise the relevance of specialist dental assessment in OI, particularly in the modern context of increased use of bisphosphonates. This is challenging to achieve and several models of delivery of care may need to be considered in this chronic childhood condition. Osteogenesis imperfecta (OI) is a collagen disorder predominantly characterised by bone fragility leading to fractures but also affects dentition (Trejo and Rauch 2016). The overall estimated incidence is 1 in 15,000 births. Classification remains based on the original ‘Sillence’ system grouped according to severity: Type I mild–moderate, Type III severe and Type IV OI intermediate severity, whilst Type II is frequently fatal perinatally (Sillence et al. 1979). The classification system has since been extended to include Type V with its distinctive radiographic appearance and additional OI types reflect identification of newer molecular mechanisms (Van Dijk and Sillence 2014). The Sillence classification was originally based on clinical and radiograph features; however, with new genetic discoveries the classification has evolved and a new genetic classification has been established to incorporate a new type of OI for each genetic defect identified (Marini and Blissett 2013). The Sillence numeration has, however, been continued for each new genetic defect discovered and as such there are currently more than 16 different types of OI (Forlino and Marini 2016). The current classification is demonstrated in Table 1. The predominant skeletal collagen is Type I collagen, formed of two A1 chains and one A2 chain (encoded by COL1A1 and COL1A2 genes, respectively) (Trejo and Rauch 2016). Mutations in these two large genes underlie 90% of OI cases and the resulting defective proteins give abnormal bone matrix, causing bone fragility, fractures and skeletal deformity (Imbert et al. 2014; Forlino and Marini 2016). The overall risk of fracture can be up to 100-fold greater than the general population, although this varies greatly between individual patients as severity is highly variable (Ben Amor et al. 2013), with fractures most commonly in vertebrae, ribs and upper and lower limbs (Forlino and Marini 2016). Skeletal deformities include a long bone bowing, kyphoscoliosis and chest wall deformities. Extra-skeletal features include blue sclera, hearing impairment and dentinogenesis imperfecta (DI) (O’Connell and Marini 1999). Dentinogenesis imperfecta (DI) occurs either as a component of OI, or as a distinct entity. It is characterised by an abnormal dentine structure in deciduous dentition alone or in both deciduous and permanent dentitions (Barron et al. 2008), although noticeably more severe in the deciduous dentition [O’Connell and Marini, 1999]. DI has an incidence of 1 in 8000 and can be categorised using Shields classification criteria (Shields et al. 1973). Shields Type I occurs in OI with COL1A1 or COL1A2 gene mutations that result in disruption of the organic dentine phase, rich in type I collagen (Sapir and Shapira 2007). The more prevalent Shields type II is separate from OI and is instead due to dentine sialophosphoprotein (DSPP) gene mutations (Sapir and Shapira 2007). Approximately 50% of children with OI will have dental abnormalities of some degree (Patel et al. 2015). Clinically, teeth appear opalescent with grey or yellow–brown hue due to defective dentine (Patel et al. 2015). Radiographically, crowns appear overtly bulbous with marked cervical narrowing, shortened roots and pulp obliteration (Patel et al. 2015). As the enamel usually appears normal, the degree of attrition is very variable and the rate of tooth tissue loss correlates with DI severity (O’Connell and Marini 1999). In addition, skeletal and dental alveolar malocclusion is more prevalent in OI than the normal population; severity of malocclusion correlates with OI severity (Jensen and Lund 1997). Paediatric medical treatment includes the now established role of bisphosphonates. The combination of fragile bones with recurrent fractures and weakened muscles provides a challenge for patients to attain and maintain gross motor skills. Physical rehabilitation is this crucial to help maintain function and independence (Engelbert et al. 2004). Placement of intra-medullary telescoping rods into long bones can be used to stabilise severe fractures and provide support for healing following correction of bony deformities (Esposito and Plotkin 2008). Since the first research use almost 50 years ago, long-term data on dental development and treatment are emerging and are reassuring, although heightened dental surveillance remains important (O’Connell and Marini 1999). OI care is highly multi-disciplinary, coordinated across several specialties. Multi-disciplinary care for children with Severe, Complex or Atypical OI was nationally commissioned across England in 2011, with four supraregional centres. The University Hospitals Bristol (UHB) Highly Specialised OI centre is a large service receiving referrals from South West England and Wales. The clinical recommendation was for all OI children to receive a formal dental assessment, ideally in tertiary care, with the referral made by the medical team. This is provided by the Bristol Dental Hospital paediatric clinic, co-located on the same precinct as the UHB OI service, which receives referrals from primary dental services and from paediatric specialist services for children with a range of chronic conditions from across the region. Service review of the tertiary care dental assessments for OI patients was initiated following clinical impression of variable uptake of dental appointments. Our review examined rates of attendance and barriers, dental pathology and interventions to inform best model of care that was feasible and appropriate for the morbidity in childhood OI. A retrospective case note analysis was conducted for all children with OI aged ≤ 18 years currently attending the University Hospital Bristol (UHB) OI Service. The primary outcome was whether an initial dental assessment was arranged at the Bristol Dental Hospital (BDH) and whether this was attended. Factors that could impact tertiary dental service provision were recorded: distance from the clinic, OI severity and previous dental experience. The second component was analysis of the types of dental issues and interventions experienced by the OI cohort in primary, secondary and tertiary care. A data collection proforma was constructed and data were collected retrospectively from hospital electronic records: patient cohort from UHB OI database cross-referenced against the BDH data, Medway® system for appointments and attendance and Evolve® patient electronic medical record, which included scanned historical paper records, clinic letters and investigation results. A preliminary search of the electronic records was conducted using pre-determined keywords (Appendix 1) followed by an in-depth analysis. In the few cases where the electronic record contained insufficiently detailed dental record, the BDH paper notes were sourced. With regard to dental pathologies, caries was diagnosed following clinical and radiographic assessment. The skeletal relationship was determined from clinical assessment alone. The diagnosis of dentinogenesis imperfecta (DI) was made from a combination of clinical appearance and the radiographic findings. The cohort comprised 92 patients: 57% male; age mean 9 (range 8 months–18 years) years. Distribution of cohort was Type I OI (91%, n = 83), Type III OI (6%, n = 6), Type IV OI (2%, n = 2) and Type V OI (1%, n = 1). The recommended standard was that all paediatric cases of OI should undergo a dental assessment in tertiary care as an outcome from the multi-disciplinary OI clinic consultation. 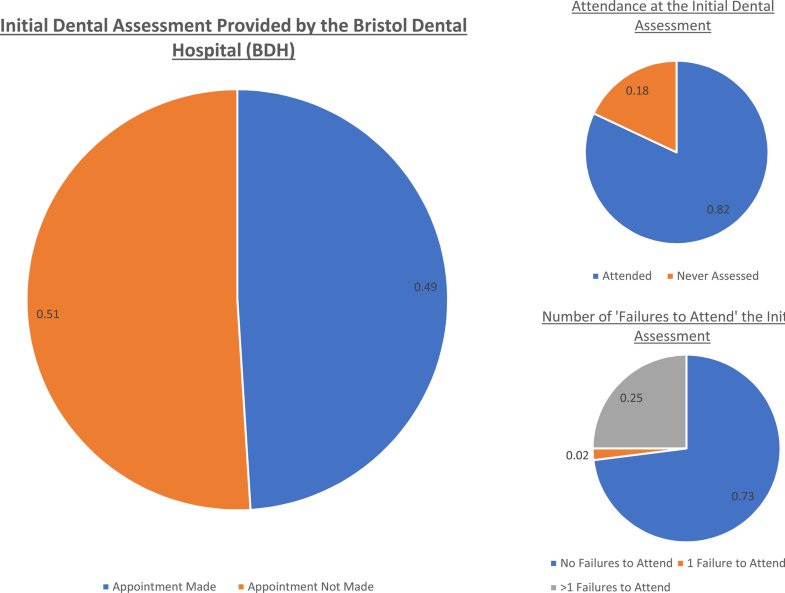 51% (n = 47) of the cohort did not have a dental assessment arranged at the BDH (Fig. 1). Of the 49% (n = 45) who had an initial assessment arranged, 82% (n = 37) attended an assessment, while 18% (n = 8) did not ever attend despite several offered appointments. Non-attendance also occurred amongst the 37 who were assessed: 73% (n = 27) attended the first assessment appointment made, 25% (n = 9) did not attend a first appointment but did attend a second booked appointment, while one individual (2%) only attended a third attempt (Fig. 1). Distance from patient’s home to UHB was mean 50 (range 4–183) miles. The mean distance travelled by those who attended the initial dental assessment was 39 miles. However, the mean distance for those who failed to attend the initial assessment was 49 miles. The OI cohort was grouped according to the distance travelled to UHB. The largest group travelled less than 10 miles (n = 24) with the second largest travelling greater than 100 miles (n = 16) (Table 2). Number of DNAs of initial assess. The DNA rate for the initial dental assessment and for all other dental appointments was analysed against distance travelled (Table 1). The DNA percentage for all dental appointments at BDH was highest in those travelling greater than 100 miles (47%). The DNA rate for the cohort travelling the shortest distance (0–10 miles) was 21%. The lowest DNA rate was seen in those travelling 11–20 miles, recorded at 0% (Fig. 2). Regarding previous dental experience, 72% (n = 66) of the whole cohort was under the care of a local general dental practitioner, whilst 28% (n = 26) was not registered with a dentist (Fig. 3). 10% (n = 9) of patients had previously received treatment at the BDH before being assessed in the OI clinic, the majority of whom presented with dental trauma, although one case had gross dental caries coupled with poor compliance necessitating treatment under GA. Of the 45 who were referred for a tertiary dental assessment, 58% (n = 26) had a pre-existing general dental practitioner (GDP), with 42% (n = 19) having no dentist. 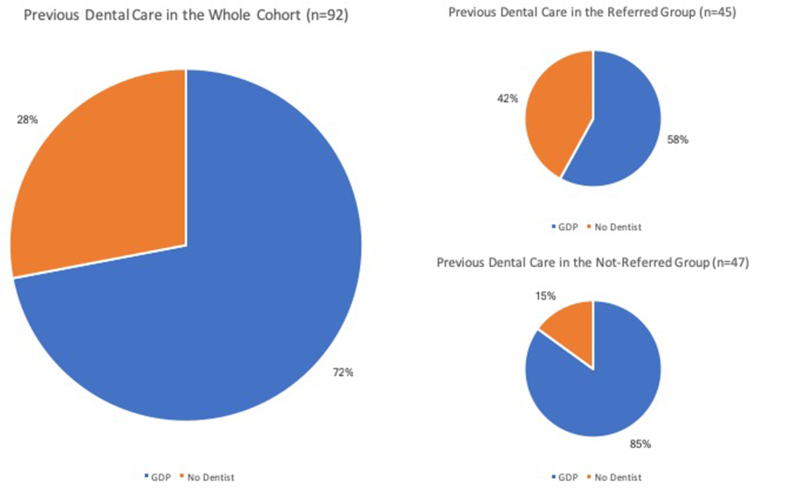 Of the 47 not referred, 85% (n = 40) received regular dental care from a GDP, with only 15% (n = 7) not registered with any dentist (Fig. 3). Of the OI cohort who attended an initial dental assessment in tertiary care (n = 37), 70% (n = 26) had no previous experience of dental treatment, 14% (n = 5) had restorations placed under local anaesthetic, 5% (n = 2) had previously undergone GA for extraction of carious teeth and 11% (n = 4) had fissure sealants placed on the posterior dentition (Fig. 4). 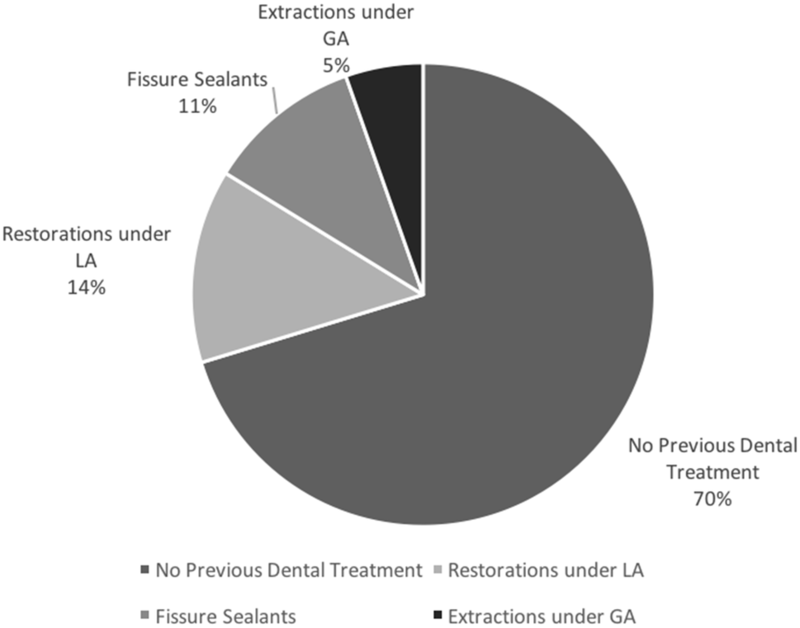 Thirty-four of those assessed in tertiary care were over 6 years of age (age by which first molars usually have emerged), four of whom had had fissure sealants applied (11%). Further analysis of the 37 who attended a tertiary care dental appointment indicated that all received a full oral hygiene assessment, with 78% (n = 29) brushing twice daily and 84% (n = 31) using a high-fluoride toothpaste. 95% (n = 35) had radiographs taken, caries identified in 41% (n = 15) and 38% (n = 14) required extraction under GA for caries. 24% (n = 9) of the assessed cohort had dentinogenesis imperfecta (DI), although the prevalence was as high as 50% in patients with Type III OI. DI was diagnosed on clinical and radiographic analyses alone. Two patients were not included as definite DI due to records indicating a subtle appearance of DI for which histological examination of an exfoliated tooth had been proposed for diagnostic clarification, although inclusion of those two possible cases would have pushed the DI prevalence of 30%. 30% of the assessed cohort had malocclusion, with a class III skeletal pattern being the most common and all required further orthodontic input. 48% (n = 44) of the whole OI cohort was currently receiving bisphosphonate treatment: Pamidronate 30% (n = 13) Zoledronic acid 16% (n = 7) and Risedronate 2% (n = 1). All were found to be under active dental care: 65% at BDH and 35% at their local GDP. We assessed dental health management of a large regional OI cohort to explore if it is realistic that all have tertiary dental assessment. This real-life experience shows this standard is hard to implement: only 49% received a tertiary level dental appointment. This could reflect that families may decline suggested additional appointments as they already received primary dental care (67%) and may not fully appreciate the benefits of more detailed tertiary dental assessment. 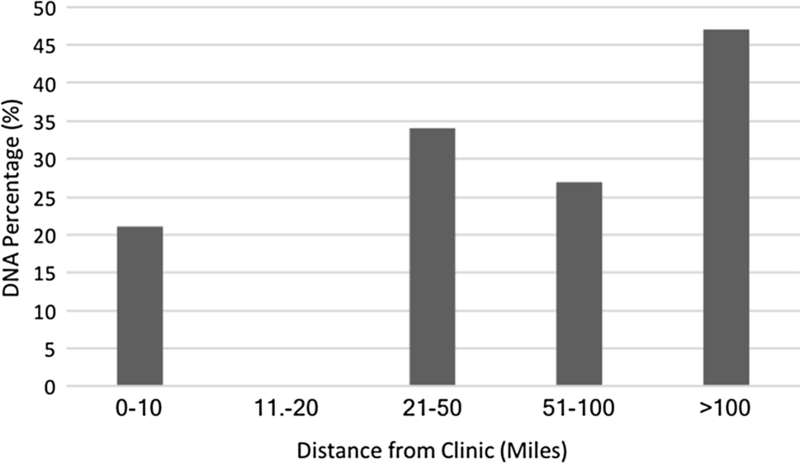 Geographic factors of distance to the tertiary clinic are relevant and influenced whether an initial appointment was made and also ultimate attendance at appointments arranged: 47% DNA rate in those travelling greater than 100 miles compared to 21% for those travelling 0–10 miles. We did not have access to their primary dental care records, so cannot comment whether those solely under primary dental care had lesser dental morbidity or interventions. But we would conjecture that the tertiary dental services will have more experience in rare children’s skeletal conditions that affect dentition and hence have better expertise to identify abnormalities and recommend appropriate interventions. Hence, early tertiary dental assessment and intervention allow for optimisation of oral health in OI and prevent the need for surgical treatment during bisphosphonate therapy (Trejo and Rauch 2016). DI represents a significant dental health problem in OI, as COL1A1 and COL1A2 gene mutations result in the production of structurally defective dentine inadequately attaching to overlying enamel (O’Connell and Marini 1999). Rapid enamel attrition exposes underlying defective dentine (Okawa et al. 2017). We restricted our definition of DI to that confirmed on tertiary dental assessment rather from medical notes, as mild DI with limited tooth colour changes may be missed by medical compared to dental professionals (Okawa et al. 2017). 24% of our tertiary level dental assessed cohort had DI, similar to the lower end of reported prevalence ranges of 30–70% (O’Connell and Marini 1999; Barron et al. 2008). Higher DI prevalence occurred with more severe OI (Type III 50% and Type IV 100%). This reflects that these OI types generally involve altered type I collagen structure causing a qualitative defect rather than the quantitative impairment in Type I OI (Okawa et al. 2017). This highlights the importance of a formal dental assessment in tertiary care for all types of OI, but especially for those with more severe phenotypes. DI increases the clinical burden of OI, which supports the value of an initial dental assessment in tertiary care for all children with OI. Fundamentally, there is rapid tooth tissue loss due to the defective dentine structure (Teixeira et al. 2008). Caries is one of the most common reason for patients with OI seeking dental assessment and treatment (Barron et al. 2008; Abukabbos and Ali-Sineedi 2013). Dental caries in DI may present later than normal as pain is only experienced when the carious lesion is extensive because of the pulp chamber obliteration, following the rapid deposition of secondary dentine (Okawa et al. 2017). We found a 41% (n = 15) caries rate in the assessed cohort (n = 37) which is similar to the population prevalence of dental caries in UK 8-year-old children (Tsakos et al. 2013). This is consistent with the current literature reporting that primary teeth affected by DI are not more prone to dental caries when compared with normal teeth as the severe wear is thought to progress faster than the spread of dental caries. A limitation of our study is that just over 50% of our cohort was not assessed at the dental hospital; so, their prevalence of caries is unknown. The caries prevalence could feasibly be less in the assessed cohort. In terms of caries prevention, the tertiary dental assessment found that most children 6 years or older (30 of 34; 89%) had had not yet had fissure sealants applied. This illustrates the value-add of tertiary dental input, as primary dental practitioners may need guidance that fissure sealants are recommended for children 6 years or older with OI, a population with a high risk of caries. Early detection and intervention are essential for successful DI management (Abukabbos and Ali-Sineedi 2013), as deciduous dentition is more frequently affected and exhibits more extensive and rapid tooth tissue loss (Sapir and Shapira 2007). Treatment aims to maintain adequate occlusal height and aesthetics, encourage favourable mandibular and maxillary development and establish favourable conditions for permanent dentition eruption (Sapir and Shapira 2007). A comprehensive management plan for the deciduous dentition should focus primarily on caries prevention, through intensive oral hygiene instruction, fissure sealant placement and fluoride application, as well as preserving tooth tissue through the placement of preformed metal crowns on posterior teeth (Sapir and Shapira 2007; Abukabbos and Ali-Sineedi 2013). The literature highlights that regular dental assessment is essential due to the potential for rapidly progressive tooth tissue loss (O’Connell and Marini 1999; Trejo and Rauch 2016). Late presentation for assessment may identify severe attrition with teeth worn down to the gingival margin (Barron et al. 2008). Treatment then becomes increasingly challenging and complex, highlighting the preventative benefit of early expert dental assessment of children with OI (Barron et al. 2008). Oral OI manifestations beyond DI include occlusal abnormalities (Rizkallah et al. 2012). Amongst our cohort, 30% had malocclusion, considerably higher than 3–8% in the non-OI population (O’Connell and Marini 1999). It is proposed that malocclusion in OI results from inhibition of maxillary growth and mandibular prognathism, combined with dento-alveolar abnormalities (Rizkallah et al. 2012). Malocclusion identified in our patients led to further orthodontic intervention in all cases. Orthodontic management in OI is often complex due to the need for orthognathic surgery and lengthy fixed appliance therapy (Rosen et al. 2011). Early intervention is beneficial for malocclusion management as earlier orthodontic treatment helps reduce treatment length (Okawa et al. 2017). Bisphosphonate therapy has an established role in current paediatric OI management (Trejo and Rauch 2016), as seen that 48% of our cohort was on treatment. Bisphosphonates inhibit osteoclastic bone resorption and reliably increase bone mass (Trejo and Rauch 2016). Previous concerns were that bisphosphonates may affect dental development through reduced resorption of deciduous dentition roots and surrounding bone delaying permanent dentition eruption (Bhatt et al. 2014). Animal studies indicated delayed dental development (Bradaschia-Correa et al. 2007), whereas recent paediatric OI data are reassuring that bisphosphonate treatment normalises rate of dental development in OI (Vuorimies et al. 2017). Bisphosphonates may complicate orthodontic treatment through osteoclast inhibition decreasing tooth movement lengthening treatment time (Iglesias-Linares et al. 2010). Bisphosphonate Related Osteo-Necrosis of the Jaw (BRONJ) is a rare severe oral adverse effect in adults where risk factors include malignancy, smoking, radiotherapy, alcoholism and malnutrition (Bhatt et al. 2014); moreover, large cumulative doses are administered in oncology (Khan et al. 2009). No cases of BRONJ have been reported in children (Malmgren et al. 2008; Bhatt et al. 2014), although the recent single case report of denosumab-associated ONJ in oncology underscores the dose-dependent risk and reminds us of the continued relevance of dental surveillance for children receiving bisphosphonate therapy (Uday et al. 2018). Reassuringly, all of our cohort receiving bisphosphonates were under dental care, although this was tertiary level assessment in only half (54%), the remainder under GDP. Recommendations for dental management of paediatric OI patients on bisphosphonates are largely extrapolated from adult protocols, although bisphosphonate doses and jaw anatomy and vasculature do differ between adults and children (Bhatt et al. 2014). Recent recommendation from Bhatt et al. for children with OI who may receive bisphosphonate therapy (Bhatt et al. 2014) stipulates the following: (1) comprehensive dental assessment and elimination of dental disease prior to commencing bisphosphonates, (2) education on maintenance of meticulous oral hygiene, (3) complete all invasive dental work prior to bisphosphonate commencement and (4) postpone bisphosphonate therapy until the dental health is optimised. There are extensive data suggesting that the estimated incidence of BRONJ following invasive dental procedures is increasing in the adult population owing to the increased duration of bisphosphonate exposure and more extended follow-up periods (Christou 2013). No cases of BRONJ have been reported in children but cases may emerge in the future as the risk of BRONJ is related to both the cumulative dose and duration of bisphosphonate therapy (Christou 2013). There are currently no guidelines for the management of paediatric patients on bisphosphonates and consequently the treatment received is highly variable (Christou 2012). However, recent recommendations suggest a thorough clinical and radiographic dental assessment along with any required treatment be provided before the commencement of bisphosphonate therapy. A cautious approach to management should be adopted due to the future risk of BRONJ through cumulative dosing and the continuation of therapy through adolescence and into adulthood (Christou 2013). In accordance with this guidance, 31% required extractions under GA before bisphosphonate therapy commencement. These GA extractions will have delayed initiating bisphosphonates and we postulate that earlier more routine tertiary dental assessment could avert these delays. Consequently, optimising their dental health surveillance is an integral component of optimising overall OI management. The study assessed tertiary dental assessments across the large OI cohort in the South West of the United Kingdom. A notable observation was that many were not referred and others then did not attend. 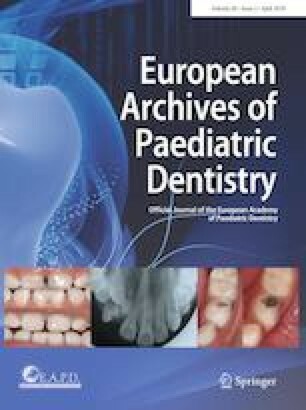 Geographic factors of travel distance to the tertiary centre appear to be an important factor in clinician-family decision whether to refer centrally for an additional appointment, especially if the child already had local dental care in place and also impacted attendance rate at arranged appointments. Finding dental pathologies in a large proportion of those assessed underscores the relevance of this component of their specialist OI care for all children and young people with OI. It was reassuring that all patients on bisphosphonates were under regular dental care, although only two-thirds at tertiary level. The central role of bisphosphonates in current paediatric OI management does predicate expert dental vigilance. Awareness of the barriers to uptake of tertiary dental care can inform new approaches to delivering this dental component of multi-disciplinary OI care. Specialised dental assessment does accurately and frequently identify significant pathology in children and young people with OI, such as caries, DI and malocclusions. .Awareness that geographic factors can compromise attendance is important to address by emphasising the clinical importance of the role of tertiary dental assessment for all patients with OI and, if possible, endeavouring to scheduling assessments to coincide with the OI assessments. All contributing authors have declared that there is no conflict of interest. This study involved human participants and was conducted in accordance with the ethical standards of the institutional research committee and with the 1964 Helsinki declaration and its later amendments or comparable ethical standards. This manuscript involved human participants. This service evaluation was a retrospective note review of anonymised data and did not entail individual participant consent process. Informed consent was obtained from all participants.